The Paw Army Foundation (http://www.pawarmy.org) has announced new recognition levels or “Rank Advancements” for members of the Paw Army! The first phase of changing animal rescue as we know it is raising a massive army comprised of an interconnected social network of animal lovers, animal recuse volunteers, foster families, animal shelters and animal rescue organizations of all types. Like any charitable organization Paw Army needs to raise money but equally important is to grow the Army of recruits on such a massive scale that it has the power and influence and infrastructure to effect massive rapid change. Tens of thousands of animal lovers work tirelessly with very limited time and resources to make a difference in their local markets and in some cases as is true with the pilot rescue organizations, even on a nationwide scale. While major national rescue organizations operate on a large scale with massive budgets and overhead, there are far more individuals and smaller organizations that until now have been limited in their ability to make a difference. The Paw Army gives everyone from an individual who decides to adopt a pet rather than purchase one from a pet shop all the way to mid to large sized rescue organizations to come together and act as one focused massive army for change! The Paw Army Needs You! We want any and all animal lovers to join Paw Army regardless of their level of financial or time commitment they have to animal rescue. Joining and participating in The Paw Army can be as simple an as limited as just becoming a soldier in our network with a click of your mouse and we wanted a way to recognize every level of effort that helps our cause. Today we are announcing new “Rank Advancement” recognition levels that will acknowledge not only those members who make a financial commitment but also and equally important recruits that help us grow by sharing the Paw Army mission with others. Members of the Paw Army can advance their rank by helping us bring on new recruits in addition to accumulating lifetime donation levels. 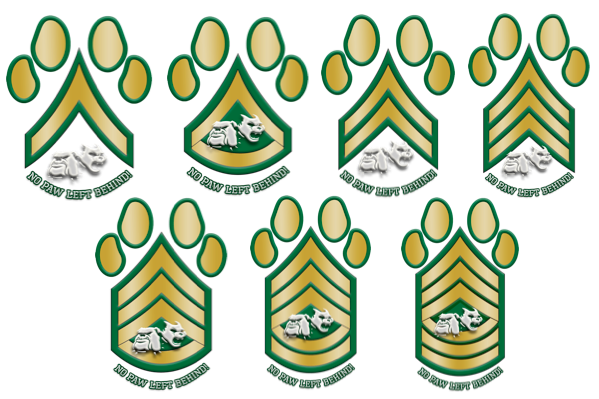 As soldiers refer more new recruits to our cause or add to their lifetime donation amount they are promoted in rank from Private all the way to Five Star General and will be forever recognized on the Paw Army Wall of soldiers!